Playwright and author Peter Mortimer. 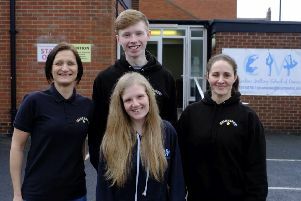 A play based on the execution of a local soldier during the First World War has scooped an award and been shortlisted for two more. ‘Death at Dawn’, written by Cullercoats playwright Peter Mortimer, was one of the winners at The Journal Culture Awards. Actor Heather Carroll, who plays three separate roles in the play, based on the real-life execution in France of the young North Shields soldier William Hunter, won the Best Newcomer category. Death at Dawn was also in the final shortlist for both ‘Performance of the Year’ and ‘Writer of the Year’. It was produced by Cloud Nine Theatre Company at The Linskill Centre, North Shields, last September and commissioned by the Tynemouth World War One Project. Only last month, the play’s director Jackie Fielding died of a brain haemorrhage, aged only 47. The play is to be revived in February 2016 – the anniversary of Hunter’s execution – but directed by Neil Armstrong. It will play for a week at Wallsend Memorial Hall. It will also be performed for one week in the Great Hall of the Newcastle Discovery museum. Funding for the rerun has already been guaranteed by North Tyneside Council and the WW1 project, with more being sought from Arts Council England.